It amazes me how quickly stores make the switch from Halloween into full Christmas mode. It is hard not to feel a slight bit of panic November 1st when the Christmas decorations fill the shelves, holiday music fills the air, and you realize Christmas is just around the corner. I hate the crowds, but I love shopping this time of year and seeing all the Christmas themed clothing, toys, decorations, housewares and books. This year I am hoping to start a new tradition with the kids. One of the ideas I have seen floating around the internet is to wrap a stack of books for them to open in the night’s leading up to Christmas. Books are already part of our bedtime routine so I thought this would be a great way to bring a bit more Christmas magic and excitement into our house. I have seen it done as a 30 day advent calendar, but I think I will shorten it and have enough books wrapped to read for the 12 days before Christmas. We already have a few Christmas books that I will wrap, but I stopped at Cole’s bookstore yesterday to quickly browse and see if there was anything new that caught my eye. 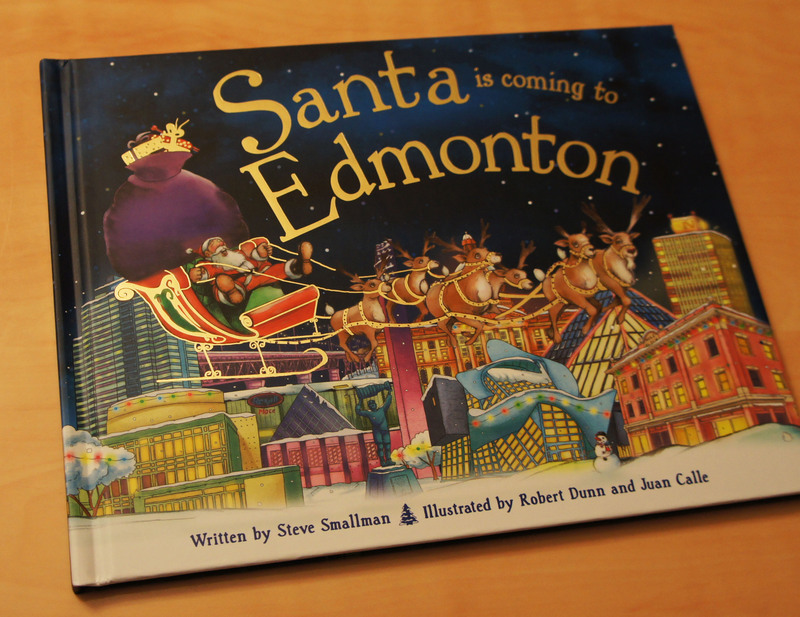 I was immediately drawn to a stack of books titled Santa is Coming to Ottawa by Steve Smallman. I picked it up, disappointed it wasn’t Santa is Coming to Edmonton and then was delighted to discover that exact title hidden beneath the Ottawa edition. As I flipped through the pages and saw the references to neighbourhoods and landmarks in our city, I knew it was a perfect Christmas book to add to our growing collection. 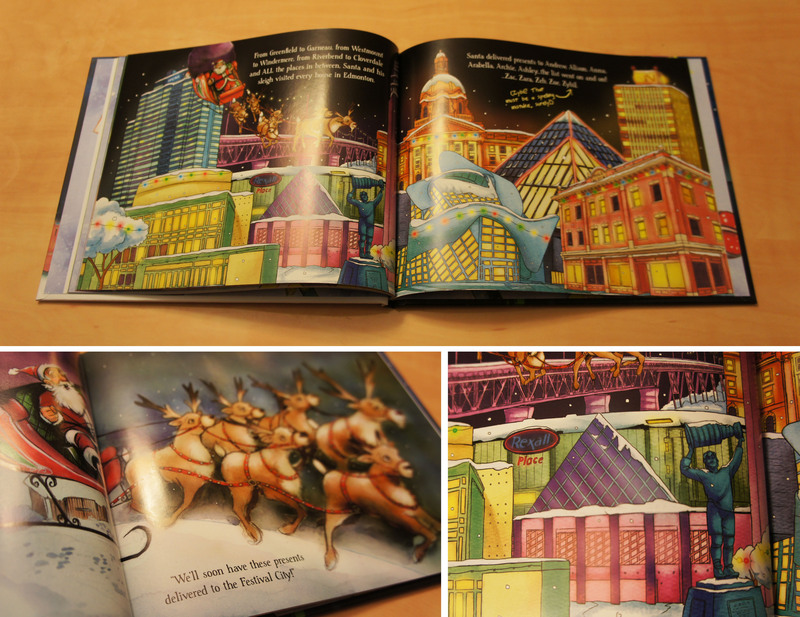 The illustrations in this book are beautiful and I love that they show the familiar landmarks like the High Level Bridge, Art Gallery, Muttart Conservatory and Rexall Place. I am not sure my kids will be quite old enough to recognize and pick them out this year, but I see them getting excited over it in the upcoming years. My three year old has just started asking about where we live and trying to figure the world around us, so I really love the relevancy of this book. This book is just one of many in the series. Other major Canadian cities that Santa is Coming to include Calgary, Vancouver, Hull, Ottawa, Toronto or just Canada. For my American friends, there is a wide variety of titles that cover states and major cities from across the country. And, because he is a British author, there is a vast range of English and European titles such as London, Belfast, and Scotland. And if these still don’t work for you? There is simply Santa is Coming to My House. Visit the Chapters/Indigo/Coles website to find all the Santa is Coming to titles.